Set rotation and orientation of PDF page. VeryPDF Image to PDF Converter for Mac helps Mac users convert many kinds of images to PDF files singly or in batches, which can not only save your time, but also save your money. Furthermore, VeryPDF Image to PDF Converter for Mac supports editing properties of PDF files flexibly and professionally. Page size and orientation of PDF can be customized flexibly with GUI interface of VeryPDF Image to PDF Converter for Mac. And this can make your PDF files more suitable for your requirement. Title, author, keywords and subject of PDF can be edited properly with simple GUI interface of VeryPDF Image to PDF Converter. By it, you can add all kinds of information to PDF file easily. 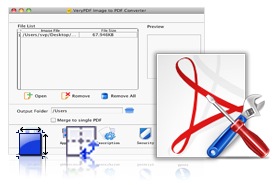 VeryPDF Image to PDF Converter for Mac can help you encrypt PDF with password of user and owner. With this perfect function, the newly produced PDF files will be much safer in open and editing authorities. Support various input image formats: jpg, jpeg, bmp, gif, pbm, pcx, png, ppm, and tiff.